Neck Liposuction – How To Avoid Scars? Neck Sagging – How to Reverse This Condition? Neck sagging is every aging person’s nightmare. However, not only do the aging end up with neck sagging. Many are genetically inclined to have this unsightly condition. Then again, someone who has lost a tremendous amount of weight may also be blessed with neck sagging. 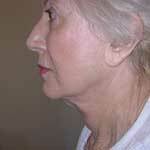 Another reason for this extra skin can be from too much fat padded under the chin causing the neck to sag. For whatever the reason may be, there is hope on reversing the condition of a sagging neckline. Blurry Vision After Cataract Surgery – What to Do?